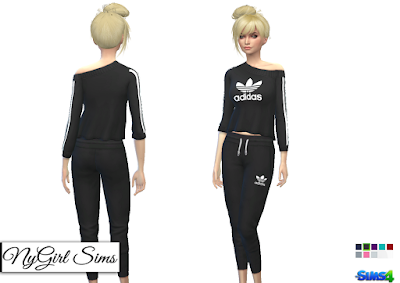 I don't usually make clothing or sets with name brands or logos, but I was in the mood today and figured why not. This is just a simple matching jogger set. Made from a mixture of TS4 textures. Mesh edits by me. Comes in 8 colors. These items are not a combined outfit, they are separates. I am still working on the plain and logo free version and will upload soon.